Cream Cheese: This recipe calls for two 8oz blocks of cream cheese. I typically use plain cream cheese, because I think the flavor of the final sauce holds up without embellishment. But, if you’re interested in using a savory flavored cream cheese, that’s totally fine! However, I would recommend doing only one block flavored. That balance (one flavored, one plain) helps to make sure that flavor in the flavored block doesn’t become overpowering and ruin your chicken. Two blocks of flavored cream cheese is too much additional flavor. Bacon: Generally, I will add a little bit of work to this uber-simple recipe and fry up some bacon. It’s a fun addition to the flavors – I mean, who doesn’t love bacon? I crumble up the cooked bacon, and mix it into the cooked chicken and sauce. It adds a nice crispy texture that really works on a sandwich. If you want to skip cooking the bacon, you might consider adding 1 bacon flavor container of cream cheese (replacing 1 plain block of cream cheese). Cooking: You may be wondering if this crack chicken needs any additional liquids – like chicken broth or water. But I can assure you that it does not. As the chicken cooks, it will release juices naturally, which will be plenty of liquid for the final dish. Remember, you’re not making a soup, just a nice, moist shredded chicken for sandwiches. The one tricky bit to this recipe is that you can’t overcook the chicken. Like any slow cooker chicken recipe, if you cook it too long the chicken will dry up. Lots of the slow cooker crack chicken videos (like the ones you see on Facebook) will instruct you to cook the chicken on the low setting. That’s a good idea if you aren’t going to be around the house to turn off the crockpot when it’s done. If you don’t have time to make up this chicken in the crockpot, there is another method. Simply brown the chicken in skillet (oven-proof). Then, add the sauce ingredients and cook them all in the oven for about 45 minutes. When the chicken is done, shred it and follow the instructions in the original recipe. To save even more time, just use a rotisserie chicken. Warm up the cream cheese and mix everything together for an incredibly simple meal. Serving: When I make sandwiches with this recipe, I’ll occasionally top the chicken with a little extra cheddar cheese and let the chicken sit under the broiler for a minute or two. This will melt that extra cheese onto your chicken, and is a much yummier option that topping your chicken with a piece of fakey sliced cheese. I like to serve this recipe on a good, high-quality roll from the bakery section of my local market. I will slather that roll in barbeque sauce and a very thin slice of red onion – it’s a perfect dinnertime treat. As you can probably imagine, this chicken makes awesome leftovers. 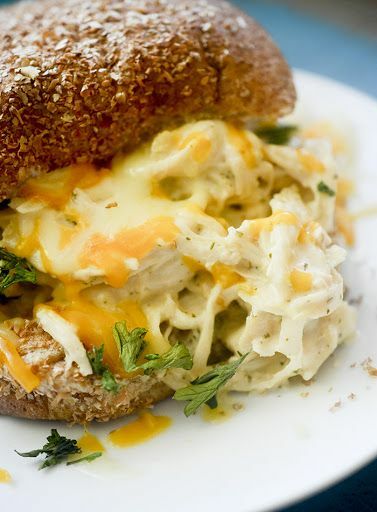 Just store it in the fridge and reheat the next day for a delicious sandwich at lunch time. It also freezes well. As long as you freeze it in an airtight container and let it thaw fully before reheating, you can definitely make this cooked chicken days ahead of time and store it in your freezer. Variations: If you’re interested in changing this recipe up a bit, consider adding a can of Ro-Tel or corn (well drained). Occasionally I’ll even throw in a package of well-drained, thawed frozen spinach. Pat the chicken breasts dry with paper towel. Place them in the crockpot. Top evenly with cream cheese cubes then spinkle the dry ranch evenly over the top. Cook on low for 6-8 hours or on high for 4 hours. Chicken is ready when it can easily be shredded with a fork. When chicken is cooked, shred it. Add cooked bacon. Give the mixture a stir to evenly combine everything. Spoon one portion of chicken mixture on half of a good quality rolls, top with cheese and set under the broiler just until cheese has melted. Spread BBQ sauce on second half of the bun and top with a thin slice of red onion. Serve. 0 Response to "crack chicken recipe"